The 150th Anniversary of the Battle of Bentonville took place on Saturday and Sunday March 21st and 22nd, 2015. Saturday’s scenario was a reenactment of the “Fight for the Morris Farm,” while Sunday’s reenactment was of “the Last Grand Charge of the Army of Tennessee and Morgan’s Stand.” Besides the battle reenactments, guests enjoyed speeches by experts on Civil War history, camp cooking demonstrations, domestic demonstrations, medical displays and Harper House tours. More than 65,000 people participated in this year’s Sesquicentennial event, including 2,500 reenactors. Confederate reenactors at their campsite. Some planned well for the day, bringing picnics and chairs. The Battle of Bentonville was the largest Civil War battle in the state of North Carolina. General Joseph E. Johnston’s small Confederate army attacked one half of Major General William T. Sherman’s Union army as it marched north from Georgia on March 19, 1865. The 20,000 Confederate soldiers and almost 60,000 Union soldiers battled fiercely over three days. The Bentonville battle was the last offensive by a Confederate army in open territory during the war. The Confederates chose the tiny village of Bentonville to launch their attack on the Union army because it was the only crossroads in eastern North Carolina south of Goldsboro where the Confederates could concentrate their scattered armies. The Confederates hoped to defeat Sherman before Union reinforcements could arrive from Goldsboro. The Union army had divided into two “wings” to enable a quicker march to Goldsboro. This split also gave the Confederate soldiers better odds since they only had to face half the Union soldiers at a time. The Confederate army battled hard, but outnumbered, couldn’t conquer the left wing of Sherman’s army. They retreated to attack the right wing on its arrival. They fought strong on March 20th, but when Mower’s Union reinforcements arrived on March 21st, the Confederates retreated across Mill Creek. Sherman let them go and continued to Goldsboro. One month later, Johnston surrendered his army to Sherman at Bennett Place in Durham on April 26, 1865. The first monument to the battle was not placed at Bentonville until 1895, and the second in 1924. Besides these two markers, the battlefield virtually went without interpretation until the 1950s. Large Civil War reenactments such as this one began in 1990. Because of the tremendous amount of planning and infrastructure required to undertake these huge events, including the lengthy preparations made by Confederate and Union reenactors, they only take place every five years. Other years, a living history program takes place every March to further awareness and promote the history of Bentonville Battlefield State Historic Site, as well as to raise funds to maintain and enhance the site. 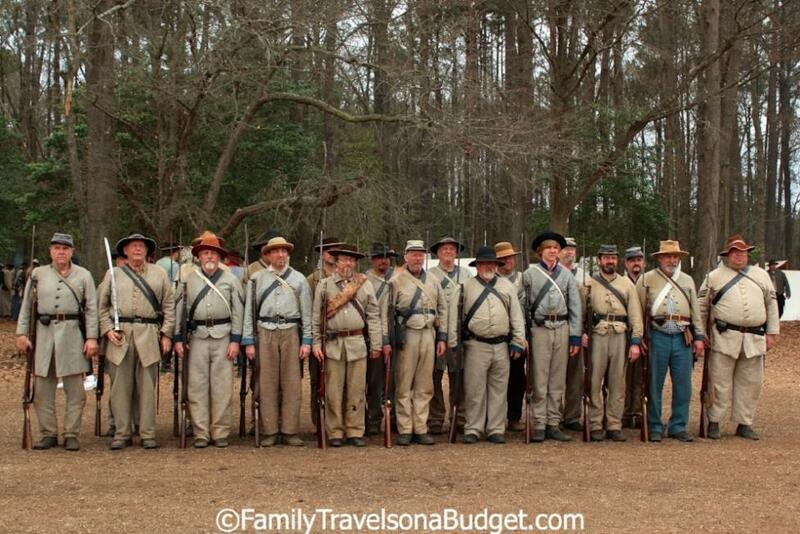 The reenactment is sponsored by the Friends of Bentonville Battlefield, Inc. an independent nonprofit 501(c)(3) organization whose purpose is to support the preservation and interpretation of Bentonville Battlefield, North Carolina State Historic Sites, and the Johnston County Visitors Bureau. The event is part of the North Carolina Department of Cultural Resources’ commemoration of the Civil War’s sesquicentennial anniversary. Please visit www.nccivilwar150.com for more information about North Carolina’s commemoration of the 150th anniversary of the Civil War.